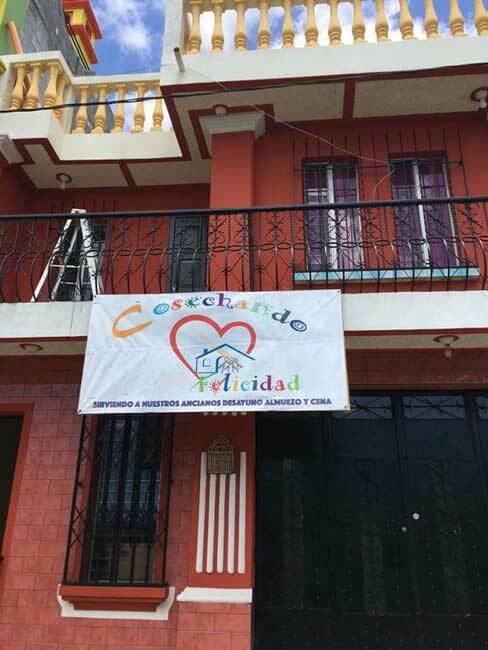 About - Cosechando Felicidad Inc.
We began our programs in 2014 and became an official 501c3 in the US and ONG in Guatemala in 2015. 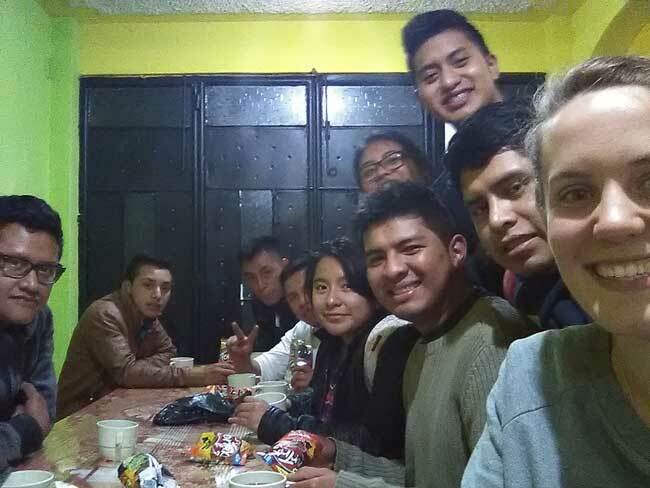 Founded by Brennan McMillan, Pennsylvania, and Emily Keller, Vermont, we are an organization seeking to empower the community of Santa Maria de Jesus, Sacatepéquez, Guatemala, especially the youth, to help their neighbors. This organization began as its founders were living in the community and began meeting needs one person at a time. This mentality of helping one person at a time has now grown into this organization. Since 2014 we have continued to grow and establish our programs. We now serve thousands of people annually and our feeding program for the elderly provided over 27,000 meals in 2016, and has grown to provide over 50,000 meals in 2017. We are extremely humbled to see how our organization has grown in such a short amount of time. We have over 40 volunteers who run the daily activities of our programs as well as two employees. We have a board of directors of five of our most trusted local volunteers who oversee the programs when the directors are in the US. In addition, we have several volunteers stateside who help us. Our programs now include our feeding program for the elderly, community center, scholarships for our volunteers, medical aid, construction projects, formula assistance, monthly grocery aid, and grocery assistance for single mothers. All of our programs have various checks and balances in place to ensure we run as smoothly as possible and are able to help those who are eager to use the help they are given to succeed. Before we enroll anyone in one of our programs, we first do a home visit to assess the need. To be eligible for our programs, families or individuals must prove to us that they have a need. We ask those who receive our assistance to come and help at the community center or with the feeding program as a way to pay it forward. Currently, our main project is a feeding program for the elderly. 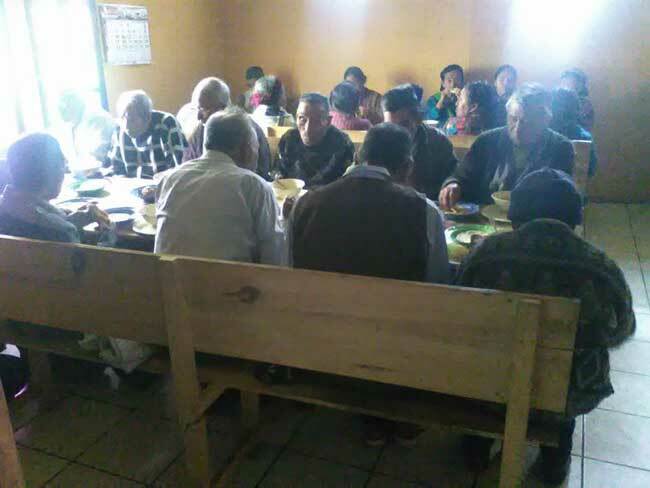 This was established after finding that many of the elderly do not eat more than one meal a day, if that, and have to work in the fields to earn money to feed themselves. This work usually means strenuous physical labor. The feeding program is open to any of the elderly in the community who are in need and feeds anywhere between 30-40 people at each meal. Additionally, meals are delivered to the elderly who cannot come to the project such as the physically handicapped. 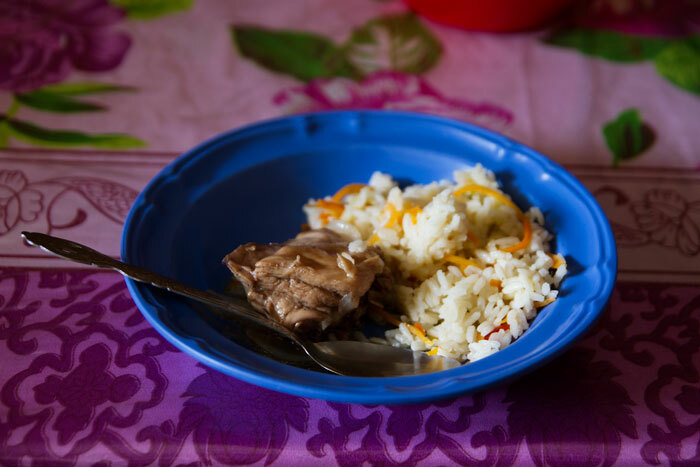 Food is served three times a day by around 15 Guatemalan volunteers. The volunteers are young people approximately aged 16-25 who are passionate about helping others in their community. They are the most giving people we have ever met and cannot thank them enough for their tireless efforts. Our two employees help to maintain the feeding program and rotate between either making tortillas or cooking the food. Each week we use 150 lbs of corn for tortillas. The building we use for our feeding program also serves as community center. We have been blessed to outgrow two facilities and are now in our third, which we hope will serve as our home base for the future. Our door is always open to our volunteers. We provide a safe place where they can come and help with the feeding program, eat a nutritious meal, get homework assistance, and more than anything else, feel a sense of community. No matter the hour of the day, there are always people at the facility hanging out and working to support our projects. We have become a close-knit group of friends who are more like family. We are growing all the time and the community knows our doors are always open to whoever would like to come. We pay for 50% of the educational costs of our regular volunteers. They must come a minimum of once a week and are assigned a mealtime to attend based on their schedule and the needs of the program. We pay 50% of their monthly payment and school supplies. These scholarships allow us to thank our volunteers for their precious time while also supporting their futures. In addition, if anyone in the community needs a scholarship they can become one of our volunteers. If a mother wants a scholarship for her child, she can come and volunteer with us and we will provide the same partial scholarship for her child. Volunteers are eligible for a scholarship once they have come consistently to volunteer for a month. In everything we do we try to instill the value of paying it forward and helping others. We bless others because we have been blessed. Living in the conditions of a developing nation means there is a lot of sickness. We will pay for a set amount of medical treatment per individual per month. In addition, each year we help several people get lifesaving surgeries and advanced medical treatments. For example, 5 year old Jeffy was born with many health issues and was able to get surgery that ultimately saved his life in 2017. 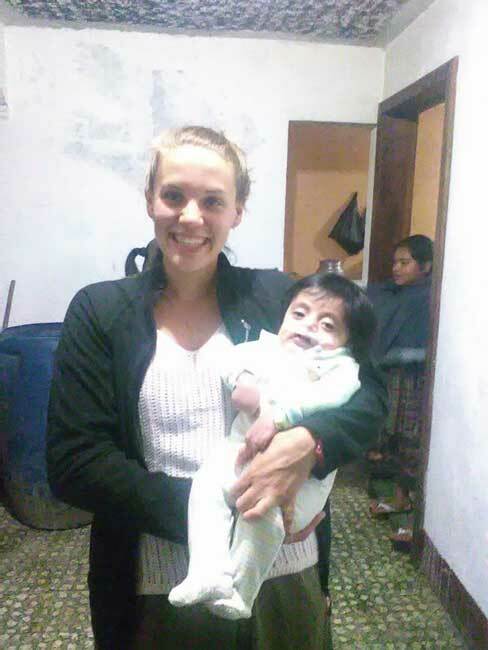 As another example, we also helped Baby Alan get his cleft lip repaired. Several times a year we welcome groups to our facility to help with projects in the community. Over the course of the year, we take note of any families who are particularly in need. For example, this may be a single mother whose children sleep on cardboard on the dirt floor of a cornstalk hut without a door. These groups do their own fundraising and we coordinate projects for the duration of their visit. We welcome the opportunity for them to see for themselves how we function as an organization. We expect any short-term volunteers to return home and share their experiences with their friends and families to raise support and awareness for the organization. It is important to note that we do not accept long-term volunteers, as we strongly believe in supporting the locals to help themselves and their neighbors. We believe long-lasting change comes from within the community itself. We provide monthly assistance with purchasing formula for members in the community who require it. If something happens to a mother here and she is not able to produce milk, it is a huge financial burden on her family. The result is usually sugar water or coffee in a bottle for the baby. There are also special circumstances such as a special needs individual who was raped and her family is trying to raise the child, but don’t have the resources. Our goal is to support families so they can raise their own children. We want to prevent children with loving parents from ending up in orphanages merely because their families don’t have the resources. Each month we provide groceries to families in need. We provide a set quantity of sugar, beans, maize, coffee, soup packets, salt, oil, rice, pasta, etc. each month. This helps to relieve some of the financial burden from families and provides them with more nutritious options for their families. Often, when families cannot provide food for their families, they live off only corn tortillas alone. We recognize single mothers are in an especially difficult situation. In this culture, it is common for the fatherly figure of the family to be an alcoholic or to have abandoned the family altogether. We think it is very important to support single mothers so their children are taken care of and can have options for a bright future. We provide a larger amount of groceries to single mothers each month. This is often what they rely on to feed their children each month. They find work when they can washing clothes, working in houses, or the fields, but with little children, they cannot have a steady job that leaves their children alone during the days. Single mothers are often the recipients of our construction projects as they are some of the most needy people in the community. On our “Donate” page you can select the option to sponsor a single mothers groceries. The cost is $20 and can be set up through automatic payments. 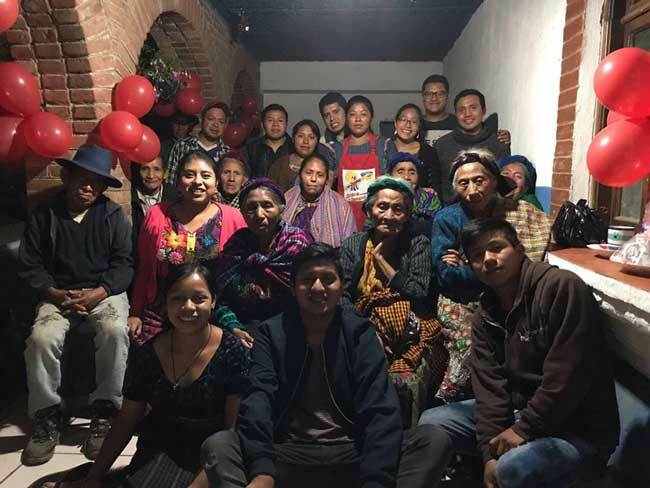 In 2018 we launched our online store to sell typical goods and merchandise from the community of Santa María de Jesús and the surrounding areas. We seek to provide employment opportunities to at risk and poverty stricken families. We want to create lasting change through small businesses and are excited to share our line of merchandise with you. The products are purchased directly from the merchants year-round at a prices that provide them a desirable income to support their family. Beyond providing employment opportunities to empower locals and provide them with economic security, 100% of the proceeds generated from the sales of our online merchandise benefit the programs of Cosechando Felicidad Inc. Feel free to shop our online store from the “Shop” tab on our website. To help support the elderly individuals and others we serve through our feeding program we have created a sponsorship program. When you sponsor an individual you are personally partnering with them to provide for their needs during the month. The sponsorship includes providing food, medical care, and any specific health-related items they may require (i.e. adult diapers, etc.). We encourage you to look further into the program by exploring the “Sponsor” tab of our website. 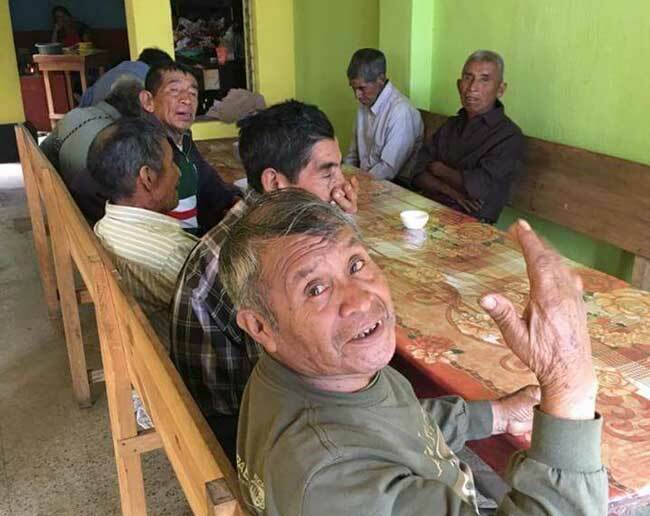 We encourage you to read “Our People” section under our “About” section, check out or blog to find out what is currently going on in Santa Maria, and explore our “Donate” page as we are entirely funded by private donations. Please do not hesitate to contact us with any questions or comments. We would love to hear from you!